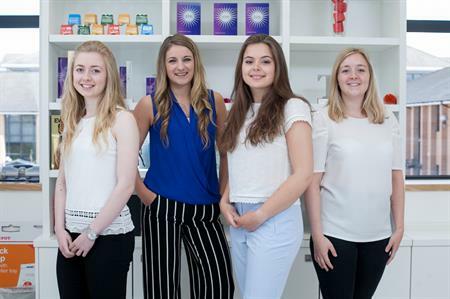 Ashfield Meetings & Events has taken on four undergraduate students as part of its year-long university placement scheme. The scheme, now in its sixth year, gives undergraduate students the opportunity to experience first-hand the realities of a career in event management. Students will have the opportunity to apply their theoretical knowledge whilst learning new on-the-job skills. Agnes Morgan (University of Plymouth), Hannah Whittaker, (University of Central Lancashire), Emily Clint (University of Gloucester) and Immy Ford (Manchester Metropolitan University) are all studying Events Management and will all join the business as project administrators. The agency has also welcomed back previous placement student Sarah Moore as marketing executive. Sarah has now completed her university studies and has returned to the business full-time. Helen Capelin, head of operational excellence,commented: "We are very proud of our undergraduate programme, for me personally welcoming the new students each year is something I look forward to. The recent recruits performed outstandingly in their assessment centre and each has slightly different skills gained in and outside of university. We will support and develop the students throughout their year with us and give them opportunities that will fully prepare them for a career in events management when they graduate."